Then again, not every woman walks down the aisle in a family heirloom. But that’s exactly what Mary Beth did when she tied the knot with her husband, Richard, donning the same gown her mother wore when she married her father a generation before. 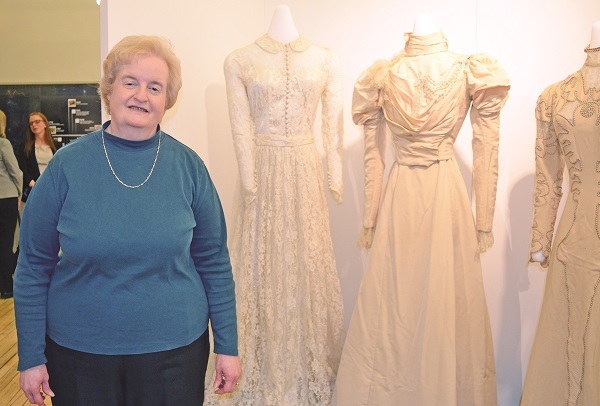 This well-loved wedding gown is one of the centrepieces of The Wardrobes of Aurora, a new exhibition launched this month by the Aurora Museum & Archives. Running through September and guest-curated by masters students from the University of Toronto, The Wardrobes of Aurora opens the closet door on the history of Aurora – births, marriages and deaths – as told through textiles in the collection. “I am not from Aurora, I’m not from Canada, but working with this collection, I found it a way to connect with the past,” said University of Toronto student Rong Zou, who co-curated the collection with fellow students Rachel Dice, Carolyn Ben and Jessica Ho. This was a sentiment echoed by other members of this quartet, who shared in the excitement. This sense of pride was shared by Museum Curator Shawna White and coordinator Michelle Johnson. Ms. White said she was “thrilled” to see the exhibition come into full bloom in this, their fourth partnership with the students at the U of T’s Master of Museum Studies program. For more on the Aurora Museum & Archives, as well as The Wardrobes of Aurora, visit www.auroramuseum.ca.